Hello lovely folk, welcome back to another blog post. This one was something that just popped in to my head one Friday evening… How would Andy handle picking out my outfits over a weekend? He was keen to help me out on this blog post… (To be honest he didn’t really have a choice). Now Andy loves his clothes, he know his stuff when it comes to mens clothes, but how would he do when it came to choosing women’s outfits? To be completely honest, I wasn’t sure about this outfit at the start when I seen it hanging. ONLY because I thought it might make me look a bit frumpy.. But when I put it on, I was in love. It had that vintage chic look that I adore. 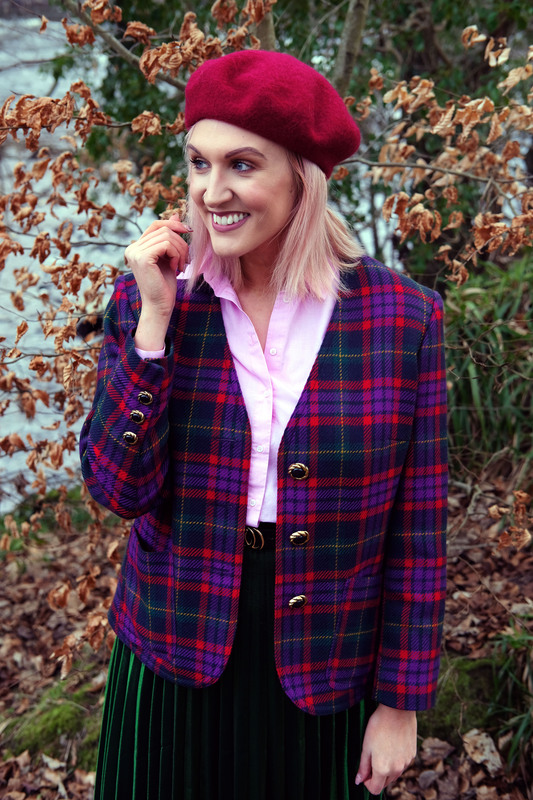 The blazer is vintage, beret is from a market in Latvia, Skirt from Pippa Boutique, shirt from Zara and shoes from McElhinneys. I loved the clash of colours and fabrics, and so did everyone else it seemed! Every where I went people were complimenting my outfit. Even Suzanne Jackson when I met her in McElhinneys! Day 2 outfit was a bit more casual but still had the quirkiness that I love. The added bowler hat was my favourite touch. Again, Andy went for a pink/red/green colour combo… He has obviously been studying SS18 trends… Colour Clashing is HUGE this year. Blazer is from River Island, Jeans are H & M, T-shirt is Primark, Dr Marten Shoes, ASOS Hat and Ray-Ban sunglasses. I was blown away that he was able to turn this blazer from something I wouldn’t pull out of my wardrobe in to this really cool outfit. Maybe Andy has found himself a new career as a personal stylist?